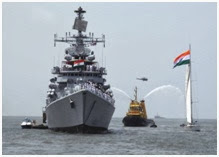 Why pursue a career in Indian Navy? The naval arm of Indian Armed Forces offers one of the most challenging, exciting, and immensely satisfying career opportunities to Indian citizens. 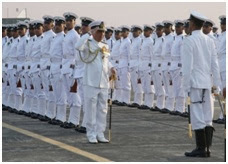 The Indian Navy has much more to offer to young men and women as compared to other professions in the civilian world. Here are some of the reasons why joining Indian Navy is such a good proposition. India has the fifth largest navy in the world. It currently employs 55,000 highly trained and qualified individuals out of which 5,000 belong to the elite naval aviation branch and 2,000 are marine commandos. The ultra-modern navy operates more than 155 vessels, including an aircraft carrier (INS Viraat), one nuclear-powered attack submarine, destroyers, amphibious transport dock and frigates. The Navy also has an air arm, known as Indian Navy Air Arm, tasked to provide an aircraft carrier based strike capability. Within this arm, there are a number of fixed-wing aircraft such as BAE Sea Harrier, HAL Kiran, Tupolev Tu-142 and some rotary wing aircraft like HAL Chetak, HAL Dhruv and Westland Sea King amongst others. A career in Indian Navy will expose the individuals to all these technologies. For many, it will be a lifetime full of opportunities to make the career challenging, personally and professionally satisfying. The individuals face complex real life problems that have national and international influence and find solutions to them. A job in the navy will offer the candidate to tap the hidden potential by putting him/her in a situation that test leadership skills and decision making abilities. The vessels of Indian Navy visit a number of foreign ports at different points of time in a year. The men that are part of Indian naval force get the opportunity to visit many of these ports, which, in normal circumstances they wouldn’t have. Don't Miss: How to make a successful career as Aeronautical Engineer? Being a part of Indian Navy guarantees world class health care and medical facilities at a very economic price. The navy has its own network of hospitals and dental facilities that provide top class medical care to each and every sailor and officer and their families at a price that pales when compared to civilian medical costs. Every officer and sailor of Indian Navy is entitled to free-of-cost accommodation. The living conditions offered are outstanding as all residential areas are populated with markets, ATMs, playgrounds, swimming pools, gymnasium amongst others. All sailors and officers are granted a monthly fixed quota of free ration. Alternatively, they can also forsake these benefits in lieu of a monetary compensation that comes added as a component of the monthly salary. After going through these tangible benefits, it is easy to figure out why a career in Navy could be the best choice to make in the present times. If one is still not convinced then the following intangible benefits are surely going to fire one’s inner self to go for an Indian navy job. Some argue that the biggest benefit of a job in the navy is the rock solid job security it offers. While employment in private companies is affected by the rise and fall of the stock market, an individual once employed in the Navy will never be asked to leave unless on serious disciplinary grounds. The salaries of private employees are also subjected to various cuts on the grounds of a sluggish economy, on the other hand, an Indian naval officer only witnesses hikes in salary throughout the career. If you have the study bug in you, Indian Navy is the place to be. By the time you retire you will end up completing two masters degree (M.Sc), one M.Phil, 1 MBA and an optional PhD. What will come as even a better surprise to most, the entire costs of these higher educational degrees is borne by the government. Those who are in technical department get the opportunity to pursue M.Tech from IIT Delhi. Being a part of any arm of Indian Armed Forces, leave Navy alone, automatically earns a candidate supreme respect and honour. Everywhere you go, whether in India or outside, your job will command you unparalleled respect and incentives. Saurabh Tyagi is a master of acute written skills as reflected by his works published on various leading online platforms. His niche lies in career and education, and is particularly interested about government jobs and career in armed forces like Indian Navy jobs.